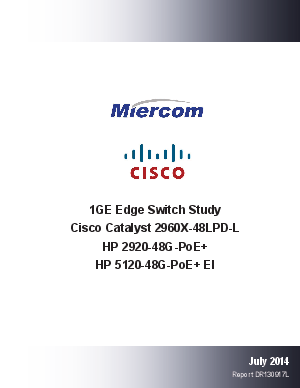 Cisco engaged Miercom to conduct a competitive analysis of its Catalyst 2960-X switch versus two comparable Hewlett-Packard switches from the 2920 and 5120 product families. Miercom executed comprehensive hands-on testing and evaluated the performance of some widely deployed features that are critical for reliable functioning of enterprise networks. The test methodology focused on specific areas in which Cisco believed there were key competitive differentiators between the products.